Highlands was awarded a $4,400 grant to crack down on drunk and impaired driving during this holiday season, according to the state’s Division of Highway Traffic Safety. The grant was awarded to Highlands as well as 19 other towns as part of a “Drive Sober or Get Pulled Over” campaign, which runs from Dec. 6 through Jan. 2, 2014, that aims at increasing patrols and holding sobriety checkpoints. 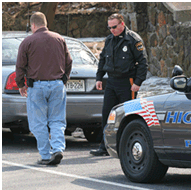 Highlands will be exercising extra patrols during weekend evening periods 8 p.m. to 4 a.m. If you are debating driving instead of walking, here are the repercussions. The patrol ends 1 hour before WindNSea and Driftwood close on NYE. Yes, per the resolution passed last night, they are allowed to serve alcohol until 5am. So on one of the biggest drinking nights of the year, this program will be almost useless. I guess it doesn’t matter since the bars have to hire a cop for the night. I can’t wait to see how many tickets are written that night or if the patrons will miraculously be well behaved. I think it’s time I set up the web cams – this is gonna be GREAT!